It is dusk and the full moon gives a quiet glow to the street. The daytime noise of vehicle traffic is replaced by the gentle chaos of pedestrians feeding into the street to converse with neighbors. 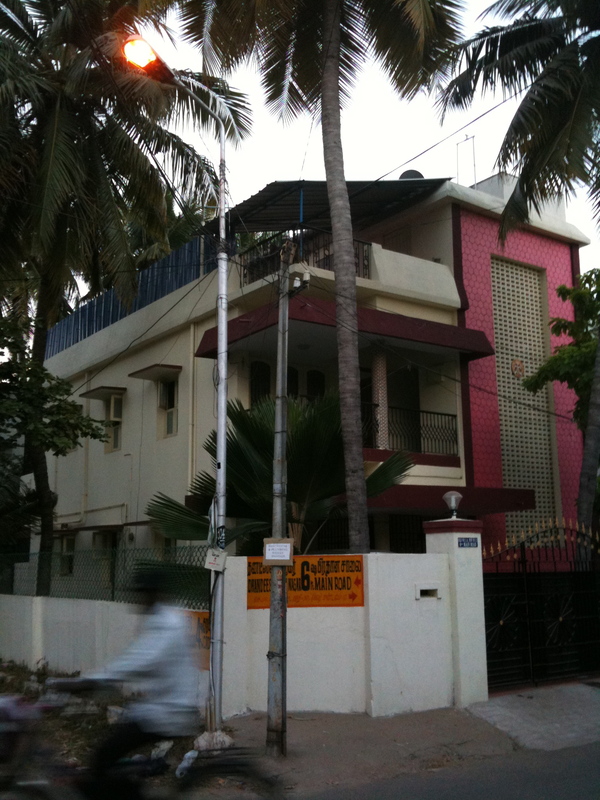 We are on an architectural walk through the streets of Velachery. At the junction of two residential streets is a small shrine to Ganesh. Two candles are lit; the elephant’s dancing shadow is caste onto the street. To a foreigner like me, these roadside deities are a curious wonder. Especially because they turn up most frequently on highly congested roads, places that hardly seem opportune for reflection. However, Vijayasanan and Nithya, two local architects, are able to explain the purpose of placing small shrines at busy intersections. People tend to pause, reflect, and pay more attention to their surroundings when they see a religious icon. Because there tend to be less accidents, and more natural order, these small shrines work miraculously as some strange form of high traffic calming. We continued onward, down from Vandikkaran Street. I paused to pick off a leaf from a neem tree, a statuesque island amongst a heap of trash. VJ points out yet another small shrine, next to the rubbish. I look for the deity but there is none; no candles, flowers or reclining Shivas. The shrine is abandoned. “If there was a statue in there then there wouldn’t be this much trash on the ground. People pollute less when there is a shrine nearby because it offends the gods.” According to VJ, other homeopathic policies these small shrines are used for include the prevention of spitting, which always comes out thick and red due to the chewing of Betel nut. In a complex world, choice can be as liberating as it can be stifling. Perhaps this was the rational of Ramasubramanian, the founder of Madhya Kailas temple in the northeast corner of Taramani. A few days prior, I was fortunate enough to hear about the origins of this temple from the great storyteller, Mr. Muthukumaraswamy, founder of India’s National Folklore Center. According to Muthukumar, Ramasubramanian a worker at the Central Leather Research Institute, in Taramani, dreampt of the merging together of two deities, Ganesh (beginning) and Hanuman (ending). Ramasubramanian shared his vision with his community, and gained support to construct Madhya Kailas temple in order to house a new and unique idol known as Adhyantha Prabhu, or the fusion of Ganesh and Hanuman. The temple continues to be well received and now also includes statues of 19 famous Tamil poets. As Nobel-prize winning economist Amartya Sen appropriately states: “A pervasive plurality of religious beliefs and traditions characterizes Hinduism as a religion,”(310). Not only is Madhya Kailas representative of Hinduism fluid reception to pluralistic ideas, it also may be seen as an organic approach to traffic calming. 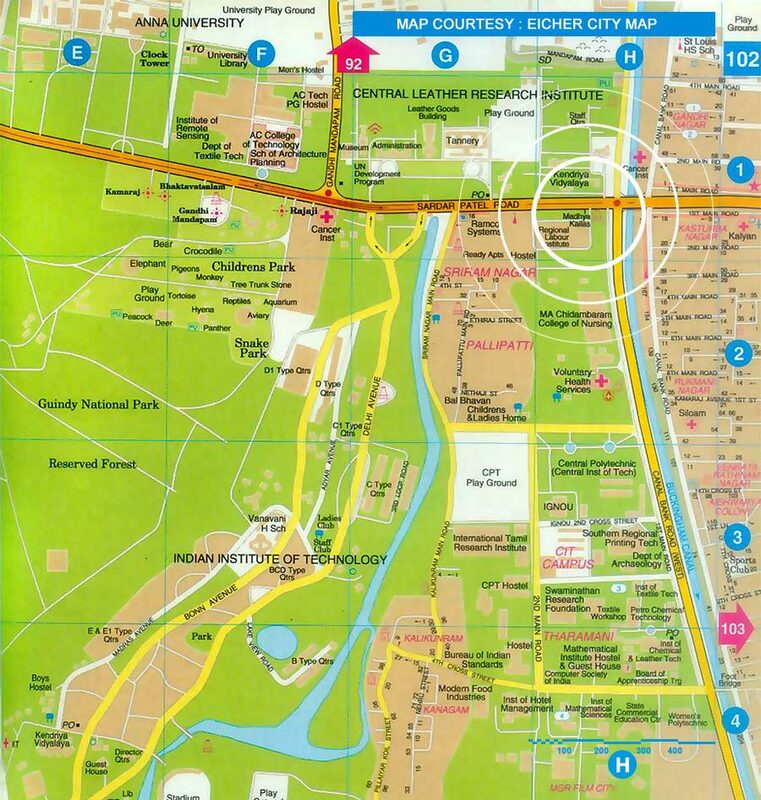 The temple is located between Sadar Patel and Canal Bank Road, by the Gandhi Mandapam, and the IT corridor. It is quickly becoming one of the busiest junctions in Chennai City. Nevertheless, there is a discernible mindfulness at this intersection that is simply nonexistent in other, less chaotic intersections. Can we draw any conclusions from this simple observation between religious icons and traffic calming? As a secular nation, should I even try to make such a connection, or, is India’s secularism as pervasively pluralistic as its most common religion? Many scholars and politicians argue that Jawaharlal Nehru’s post-independence state is a failure because of the Indian Constitution’s fierce protection of all religious. One of the most-often cited examples of secularism failure was in 1991 when two Hyderabad parents were put on trial for selling their 10-year-old daughter to a 60-year-old Saudi-Arabian national. The “Ameena Case” received national attention for numerous reasons, one of which was the problem of pluralistic religious laws. The Child Marriage Restraint Act (CMRA, 1929, 1978), which falls under the (national) Indian Penal Code, states that women must be at least 18 to marry. However, Muslim Personal Law (MPL, 1937) says marriage may occur once a woman reaches puberty. The British established Application Acts, such as the MPL, in order to recognize and respect India’s various religious communities. These laws remain to this day (Rajan 2003). CRMA is a national law and thus applicable to Indians of all religions. However, in the case of personal matters, such as marriage, MPL law prevails (Rajan 2003; Sahgal and Sarita Rani, 1993). The Non-Existent Critique is the simple belief that the debate around Indian secularism is without any significance and, therefore, doesn’t need to be debated. The Favoritism Critique is an attack against secularism for its underline favoritism to the Muslim minority. The Prior Identity Critique is the belief that religious identity is given political priority over a totalizing national identity. Indians identify themselves politically through their religion. The Muslim Sectarianism Critique is an offshoot of the former, arguing that while Hindus first consider themselves “Indian,” Muslims first consider themselves Muslim. The Anti-Modernism Critique: is a somewhat detached argument, stating that secularism is a just a superficial folly of modernism. Although none of these critiques may speak directly to my question of the relationship between the religion and order within the urban environment they do speak of the juxtaposition between the political tensions on a national level and the social acceptance and integration of religion within the everyday realm. Rajan, Rajeswari Sunder. 2003. The Scandal of the State: Women, Law, and Citizenship in Postcolonial India. New Delhi: Permanent Black. 42-43. Sahgal, Priya and Sarita Rani. 1993. “Brides for Sale.” Sunday, 19-25 December: 36-42.